Now that it's winter time, we have to find a way to stay warm, but usually our heating bill tends to be higher during the winter months. A good alternative is to just buy a space heater. 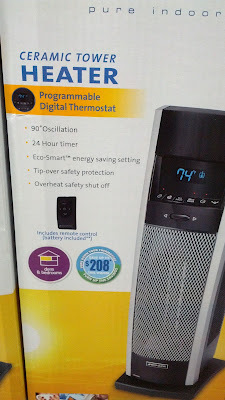 A good space heater is the Bionaire Digital Ceramic Tower Heater which features a programmable digital thermostat which allows you to set the temperature at a comfortable level. Not only that, if you use this heater to warm you up while you're in a particular room, that'll be a whole lot cheaper than using the central heating of your house. It's cheaper to warm up one room as opposed to heating up the whole house. You could definitely cut the cost of your heating bill with the Bionaire Digital Ceramic Tower Heater. If you're looking for a portable air conditioning unit instead, Costco has the DeLonghi AN125HPEKC air conditioner. 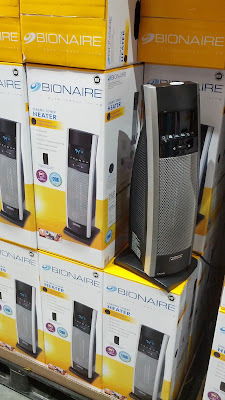 Warm up your bedroom during these winter months with the Bionaire Digital Ceramic Tower Heater. The Bionaire Digital Ceramic Tower Heater ensures that you don't have to heat up your whole house to be warm. 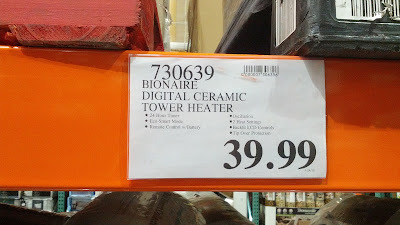 The Bionaire Digital Ceramic Tower Heater will practically pay for itself in the savings from your heating bill. Pure Indoor Living. Turn down your thermostat and turn up the savings. Save up to $208 this winter.